A limited edition chocolate box for Christmas, beautifully decorated with a botanical illustration of the traditional Christmas Poinsettia. 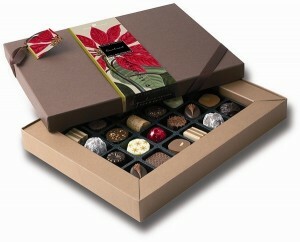 This festive chocolate box contains a superior selection of 24 assorted chocolates of 12 types (contents may vary). With our compliments of the season!